After landing in Anchorage early this week, the real deal of NO SNOW is staring me right in the face. There’s no snow! It’s been warm and it’s even rained so that lakes aren’t looking too solidly frozen either. Driving north to Wasilla doesn’t improve the situation. I even heard someone comment, “Our winter is over.” Sure looks like it. Having just departed Wisconsin with many days of subzero temps, serious wind chill, moderate snow cover and a couple of feet of ice on out lakes it sure looks and feels like spring in the 49th state. Iditarod announced on February 10th that their start would be moved to Fairbanks. The Junior Iditarod announced a little later that the younger mushers would be starting their 150-mile round trip trek on Willow Lake rather than Knik Lake. Then on February 24th, after more unseasonably warm weather, the Junior Iditarod Board of Directors announced a move further north. The race start for the 14-17 year old mushers will be near Cantwell where most mushers have been training this season. 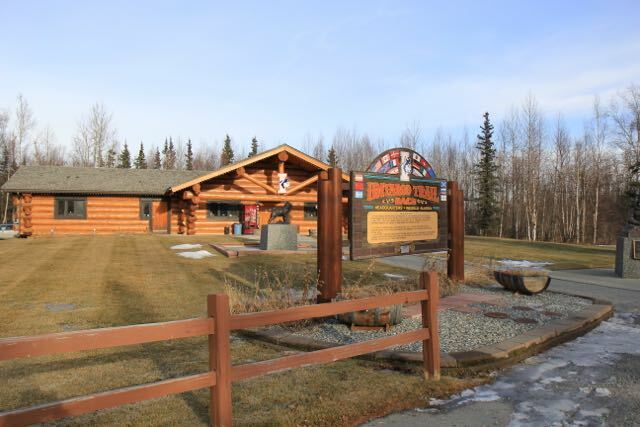 They’ll travel along the Denali Highway approximately 65 miles east to Alpin Creek Lodge. They’ll camp and take their mandatory 10-hour rest long with differential and then return to Cantwell. Not only did the route change but also the day. The race will now begin on Sunday March 1st at noon. Plans are being finalized for the post race banquet. The field of eleven juniors includes six rookies and five veterans. Nicole Forto, Kevin Harper, Jimmy Lanier, Janelle Trowbridge and Andrew Nolan have all experienced the “traditional” junior run out to Yentna Station Roadhouse and back. Those veterans will be joined by Willow mushers, Dakota Schlosser and Jordan Seager along with Marianna Mallory from Chugiak, Joan Klejka out of Bethel, Ksenia (Katie) Deits who resides in Anchorage and Rose Capistrant from Healy. The new race route along the Denali Highway will put all, rookies and veterans alike, on equal terms. Here’s a brief run down on the rookies, who they are, what they like to do and what their future plans are. Willow musher, Dakota Schlosser, started mushing at the age of five. The high school junior likes building things like street rods and dog sleds and he likes working on cars. His extra-curriculars at Su Valley High School include build-a-plane, cross-country and track. Long term, Dakota wants to get his pilot’s license and he intends to continue his life with dogs. Marianna Mallory currently from Chugiak and formerly from near Nome says watching the Iditarod is what motivated her to get into mushing. She’s been on the runners since she was three. The Chugiak High junior swims competitively and also likes to hike. While she hasn’t decided exactly on her long-term goals, mushing will be a staple in her life. Jordan Seager from Willow is 14 years old. He started running dogs just last winter and says he loves the time with the dogs. The home-schooled 8th grader plans to go into the military after graduating and yes, he wants to continue mushing. With four older mushing siblings, it was inevitable that Joan Klejka would take to the runners. Mushing since the age of four, Joan who is a tenth grader at Bethel High participates in cross-country, choir and art. Joan enjoys reading and running. Joan plans to attend UAF and she’ll continue to mush. It looked like fun and that’s why Katie Deits started mushing in 2012. After moving to Alaska from California she was able to give the sport she’d always found interesting a go. As a tenth grade student at Bartlett High in Anchorage, Katie enjoys Tae Kwon Do, biking and hiking. Mushing will remain in her future. Deits’ dogs have run Iditarod in the past and will run to Nome again in 2015. Rose Capistrant from Healy has been around sled dogs all her life and first stepped onto the runs at the age of five. Both of her parents have run Iditarod. The homeschooled ninth grader enjoys gardening and cooking as well as ballet, violin and voice. The six returning veterans have collected a variety of awards and honors from their previous Junior Iditarod races. Here’s a summary of their interests, future plans and past recognition. 2014 Red Lantern recipient Nicole Forto has been on the runners since she was just three years old. The family left Colorado and moved to Alaska to pursue their mushing dreams. The senior at Houston High says she could play softball and run dogs all day long. Nicole has her eye on a future in marine biology and plans to attend UAS. Jimmy Lanier says he comes by mushing naturally. His dad has run Iditarod 15 times and his mother is also an Iditarod finisher. His first time on the runners was two months before he was born. This is Lanier’s 3rd Junior Iditarod. Jimmy who loves baseball, skiing and hunting, sings in the Chugiak High School choir and happens to be fluent in Russian and Spanish. Lanier plans to go to college and mushing is a “maybe” in his future. Jimmy placed 4th in the 2014 Junior Iditarod. Janelle Trowbridge is a senior at Nome Beltz High. Janelle and her family came to Nome via the Northwest Passage on a 30-foot wooden sailboat and decided to stay there. The family first acquired a team of Greenlandic Huskies and learned to mush with the mighty freight dogs. They’ve added more dogs to their kennel, and Janelle says they are off to a great start and ready for the 2015 Junior. Janelle likes to cross country ski and participates in National Honor Society and Student Council. She plans on applying to the Coast Guard Academy. As the highest female finisher in 2014, Janelle received a fur musher’s hat made by 1985 Iditarod Champion, Libby Riddles. 2014 5th place musher, Andrew Nolan returns to the Junior Iditarod. Nolan is a home-schooled tenth grader who enjoys running, trapping, hunting and fishing. He plans to continue mushing after graduation and is looking forward to a career in construction or commercial fishing. As a rookie in the 2014 Junior Iditarod, Kevin Harper earned 3rd place and also received the Sportsmanship Award. Harper moved to Alaska from Washington State. Before moving north, Harper was an avid participant in wrestling and soccer. Mushing took over as his sport of choice once he arrived in Alaska and met Ray Redington Jr. Kevin loves hunting, fishing and snow machining. He plans to attend college in Alaska and is aiming to become a licensed pilot. Mushing will remain a part of his life. A rookie meeting is scheduled at Iditarod Headquarters on Thursday evening at 6:00 pm and the mandatory musher meeting is scheduled for Friday at 5:00 pm. The Junior IDitarod will start at noon on Sunday March 1st just east of Cantwell on the Denali Highway. For more information and to follow the Junior Mushers, go to jriditarod.com. Lynden is a major sponsor of the Junior Iditarod.